After connected all port well, then TV will show screen with SSID, PSK, IP Address. (ports including: USB charger port,HDMI Port,external antenna port). Below Screen, it will show waiting for connection. please ignore it. Setting--More--Wireless Display--choose device SSID and enter PSK--Connect--Screen cast now. if do not use. choose wireless display-close. Setting--WLAN--Choose device SSID name and enter PSK. Browser--192.168.203.1--Lollipop Home-WiFi AP--Scan--Choose your home wifi name and enter password--Connect. After connected,this page will be error or need to refresh.it does not matter. Check your TV screen right corner, The router will show your home wifi name. then it is successful connected. Setting--wireless display--screen mirroring--connect SSID and PSK. Make sure your TV voice is opened. Iphone is same way. only replace wireless display into Airply. 1.if enter 192.168.203.1 is not successful in browser. please change a browser. 2.Different android phone has different name for Miracast. 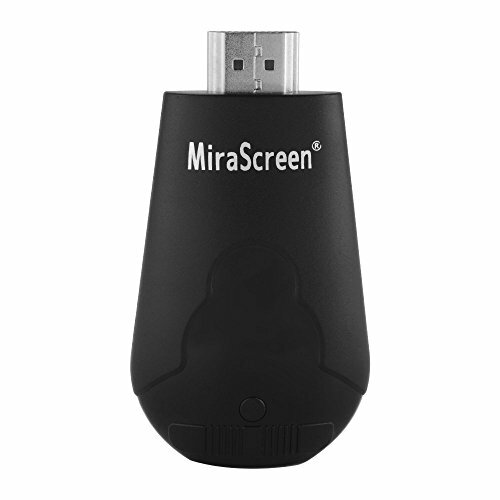 Support Miracast Airplay DLNA Protocals. Compatible with Android 4.4and above, IOS Device 6.0and above,Windows8.1,Windows10 and above.  Android phone must have mirecast function(different phone has different name for this function,please check it).IOS Device must have airplay function.PC must be windows8.1, windows10 or above.Also support Carplay. Car must have HDMI Port,and support 720P RESOLUTION. Not Compatible with Apps which have "HDCP" video copyrights protection like Netflix, Amazon video, DIRECTV, HULU other App which need to be paid fee. We warrant this item 12 MONTHS and 30 Days of easy returns from date of the original purchase for manufacturer defects, please feel free to contact us if you have any questions.